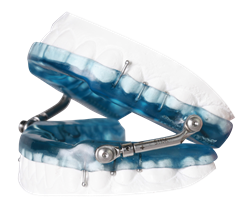 Oral appliances can be a great choice for treating sleep apnea. Where the CPAP was once the gold standard in sleep apnea treatment, oral appliances have recently emerged as a new viable solution. At Core Sleep Solutions, Dr. Gary Core recommends the Herbst oral appliance to meet the needs of most of our sleep apnea patients. What is the Herbst Oral Appliance? The Herbst appliance is a small, acrylic apparatus that fits on the upper and lower teeth like a retainer. The Herbst appliance is worn while the patient sleeps, modifying the position of the jaw. The appliance moves the lower jaw slightly forward, causing the muscles and soft tissue of the upper airway to tighten, keeping the air pathway open and preventing the patient from experiencing a disruption in breathing. Not only is this appliance quite effective in treating sleep apnea, but patients find it to be very comfortable. Patients can drink, speak, and have the ability to completely seal their lips while wearing the Herbst appliance. The appliance is discreet, eliminating the noise and bulk that come with the conventional CPAP machine and it is exceptionally durable so you won’t have to worry about frequent repairs or replacements with normal use. How much does the Herbst Appliance Cost? Once diagnosed with sleep apnea by a medical professional, patients typically have no problem getting the appliance. This sleep apnea treatment is covered by most insurance and Medicare. What is the process of obtaining a Herbst Appliance for my sleep apnea? a dental appointment with Dr. Core for impressions, the creation of the appliance, fitting the appliance, and following up to make adjustments. new appliance out for a period of time, you’ll come in for periodic follow-up visits to ensure it’s working properly and so we can make any needed adjustments. Core Sleep Solutions has helped countless people treat their potentially dangerous sleep apnea. North Phoenix sleep apnea dentist Dr. Core and his compassionate staff strive to help our patients reclaim their sleep and live healthier lives. Contact us today for a consultation and to learn more about how we can help.